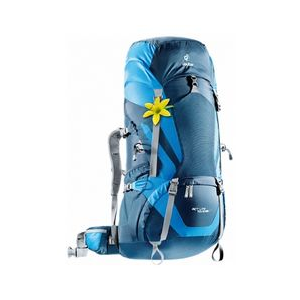 This backpack is wonderful for outdoor excursions and backpacking trips. 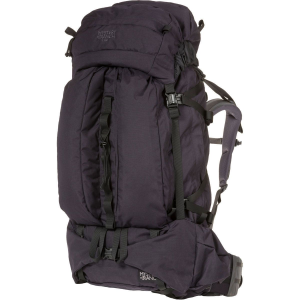 It is a little on the heavy side, but it is perfect for moderately long backpacking trips. Holds all of the gear, food, clothing, and first aid I need for a comfortable and fun trip into the wilderness. I recommend this product highly for avid and casual backpackers alike, as it fits well and functions in a practical and efficient manner. This pack has a lot of storage space conveniently separated into different compartments, while the main compartment has three access points on the top, middle, and bottom. The back of the pack has an Ergo-Fit feature to adjust the shoulder height based on body size. It is extremely comfortable, and easy to wear across long distances, for long periods of time. The rain fly stored in the bottom of the pack is an added bonus to keep your pack dry on those rainy days. The large amount of daisy chaining on the side, front and shoulders of the pack makes it easy to attach gear to the outside of the pack. 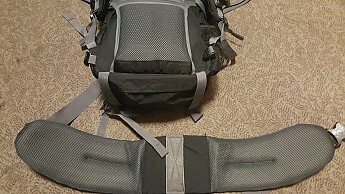 The backpack comes with two velcro straps that can be moved around the pack, which help to attach gear outside of the pack. There are a lot of adjustable straps and pull-strings that make adjusting the pack's profile very easy. On the bottom, the waist strap is removable, in case you don't want that on there. The waist strap is not very adjustable and is slightly loose if you are thinner. The top compartment of the pack may be a bit loose at times and tends to move side to side even when strapped down all of the way. The pack itself is a bit heavy, making trips that require ultra light gear difficult. This pack is absolutely amazing. I received it as a gift from a family member and it has performed well for me since I got it over a year ago. The fit of the pack is very adjustable and allows for a lot of customization. 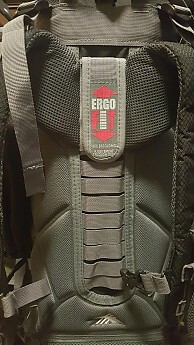 The best part of this pack's design is the inclusion of the Ergo-Fit feature which allows the user to adjust how high the shoulders of the pack sit. If you are shorter, you can adjust the pack to fit your shoulders and back size, and if you are taller, you can pull it back up and it'll be comfortable for you. I tested this on someone I know who is shorter than me by about a foot. I adjusted the Ergo-Fit feature by lowering it, and the shoulders fit her perfectly. Then afterwards, I adjusted the shoulders back up to my tall size, and it fit me like a glove. The hip belt is a great addition, however, it does not adjust all that much, which is a problem for me as I am fairly skinny. To get around this flaw, though, it is removable and you can wear the backpack comfortably without it. The shoulder straps are very comfortable and fit fairly well. While I'm wearing the pack, I can feel air coming in through the bottom, and it keeps my back from getting too sweaty. The frame of the pack is removable, which allows for a preference of a framed/frame-less pack. I cannot say for sure if the volume of the pack is accurate, however, I can vouch for the pack by saying it holds a lot of gear. It is capable of holding all of my gear that I will need for a five-day trip, and then some. To stow the gear away, the backpack has many convenient pockets, that are located in good spots. 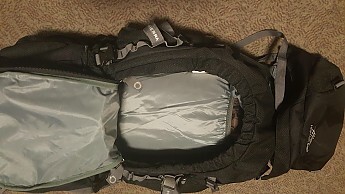 The pack has two mesh pockets on the sides near the bottom, two oblong zipper pockets on either side near the middle of the pack, two upper pockets located in a separate compartment that clasps to the front of the pack, one large compartment that has three access points from the top, middle and bottom of the pack which is very convenient, a bottom compartment, and a pocket below the pack that stores the rain fly. The rain fly is large enough to fit the pack, even when stuffed full of gear, and it cinches up around the pack with a pull string. It keeps water out of the pack well! The three access points to the main compartment of the pack are awesome! Another problem I have with the pack is that the top separate compartment seems to remain loose and moves around when it has gear in it. The straps don't pull in quite far enough to keep it from moving when it is holding a minimal amount of gear. The rest of the pack does not seem to have this issue, as it can compress to smaller sizes to fit different loads of gear and still function well. Other than that, the top compartment is fully capable of holding a large quantity of gear, that is easily accessible. If the top compartment is not needed, it can be removed altogether. The zippers of the pack can be a bit sticky at times, but they are durable. The stitching of the pack has not torn after I have been fairly rough with it, and after I shoved tons of gear in it to test its capacity. It's fallen on rocks before, and it as been scraped against granite, but there are still no holes in the pack. In fact, after almost a year, the pack looks brand new. This pack lived up to my expectations and was a wonderful gift to receive. 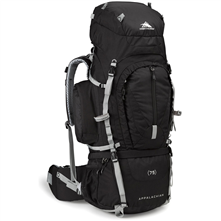 I recommend this pack to any casual or avid backpacker, or to any backpacker that is looking to get into the activity because it is one of the best I have seen or worn in terms of function, durability, and comfort within its price range. Welcome to Trailspace, William! Thanks for sharing such a helpful first review with us! I'd love to see some pictures of your pack in your review, if you're willing to add some. Whoops, I was gonna say, as I love educating people on gear! Thank you, William! We'll look forward to reading more of your reviews. Just in case you need the info: to add pictures to your review, click on the yellow "Edit this Review" button by your review. You can add pictures to the body of the review by clicking on the photo icon above that section (looks like a little green tree). Alright, I got the pictures uploaded, hope it helps! Affordable, high quality, durable, roomy, comfortable pack. Not a con, but it is not made to be an ultralight. Let me start off by saying that I would definitely recommend this backpack. I purchased the pack from Sunnysport.com. They were fast and the price was right at $90. I would recommend Sunnysport.com. I love the fact that it is top loading and front loading. I also like the removable day pack that doubles as the lid or top of the pack. I was able to carry loads over 40 lbs. very comfortably. 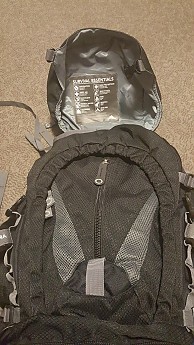 I would especially recommend this pack to those who are just getting started in backpacking since it is "Very" user friendly. 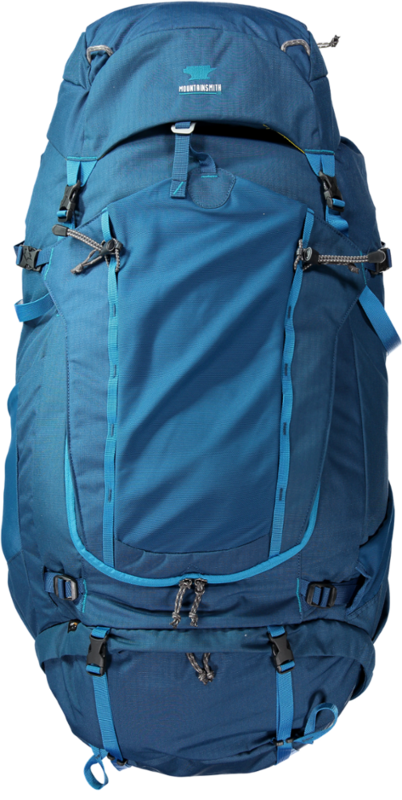 Having said that, this pack would be even better for the more experienced backpacker since they would know more about the ins and outs of packing it. The pack is also very versatile for body types since it is very adjustable for differing torso lengths. This pack has over a dozen different torso settings so it will fit most anyone. I am 6'1" and weigh 230 lbs and I have not hiked in years and I have never owned a hiking backpack; I have used hunting backpacks. Therefore, I spent literally weeks researching backpacks on the internet and at the local small outfitter. I looked at all brands and all price ranges. I knew that I was not going to go out and spend thousands of dollars to get the lightest tent, sleeping pad, mess kit, etc. So I knew that I needed a larger pack. I will also say that I am not a weight weenie. I am a full time police officer and I have walked around, and run around, for over 21 years with over 30 lbs. of gear being worn daily. I went to the outfitters and saw how small a 55 and 65 liter bag was so I began to look at 75 liter bags and above. I was eventually impressed with all the positive reviews of the High Sierra Appalachian Trail 75 liter bag. I was even more impressed that I was able to get it with free shipping for only $90 dollars from Sunnysport.com. I purchased the bag and have used it twice on approx 8-mile hikes with one being an overnight hike. I will say that the the belt issue (being too large for small wasted people) that many speak of could be a problem if your waste is too small. Having said that, my daughter who is an average size 12-year-old has a waist far smaller than 32 inches. She asked to carry the pack on a hike and I was able to adjust both the back setting and the belt to nearly fit her perfectly. I love the ease of access either through the top or through the front of the bag. There are two outside side pockets, a large double pocketed pack lid, and a front pocket to hold the essentials that you might need to get to quickly during your hike. I like the media pouch on the shoulder strap and the mesh pockets on the hip belt. Some reviewers have complained about the bag weighing too much. My response to that is, first off it is a 75 liter pack and therefore will weigh more because it is a large pack, secondly the pack is built to last, and lastly it has well padded straps and hip belt which add weight. The straps are also quite long and can be trimmed down to eliminate some extra weight. I will say that once you get your load strapped down tight with the multiple tightening straps, and you get the pack dialed in for your body, the pack carries heavy loads very comfortably. My pack weight is over 40 lbs and at times has been 50 lbs. I have have no complaints with this bag. I love it. I can carry all my equipment and necessities inside the bag. It is also very convenient because it is top and front loading. I would truly recommend this pack to anyone. 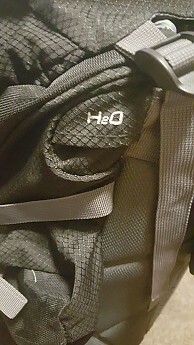 I have been on many day hikes using this pack. I have carried loads from 30 to 40 lbs, up to nine miles. I have never had any issues with the straps coming loose. I have not had any troubles with the zippers either. I have now been on two different two-night and three-day hikes with my High Sierra Appalachian Trail 75 liter pack. Sadly, I am not a wealthy man so I cannot afford to purchase the high priced and low weight items so my pack weight for each trip was 49 lbs. The pack preformed perfectly. Obviously with 49 lbs, the pack holds a ton of gear. And even at 49 lbs. I had no issues with any straps loosening or buckles breaking, and once I had it dialed in I was good to go. I would venture to say that 49 lb. loads probably is about the limit for plastic buckles, but that is just common sense. 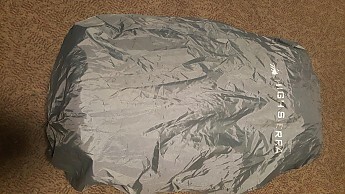 I fit a large Therm-a-Rest self inflating pad 78x25x2.5, my 30 degree Kelty synthetic sleeping bag, large two man Stansport Starlite 2 tent (I highly recommend this tent), full two liter Platypus water pouch, 1 liter Gatoraid, Frogg Toggs rain gear, camp pillow, fuel bottled camp stove, camp shoes, three pairs of extra socks, tent light, first aid kit, camp towels, Sawyer squeezable water purifying kit, mess kit with utensils, food and snacks, collapsible fishing pole and reel, small fishing kit, and a few odds and ends; and the bag preformed perfectly. I am still using this backpack regularly and I still love it. I have not had any issues with the pack letting me down. I plan on using the pack in a couple weeks for a planned couple day trip. Thanks for the gear updates, Kevin. I'm glad to hear this pack is still working out for you. 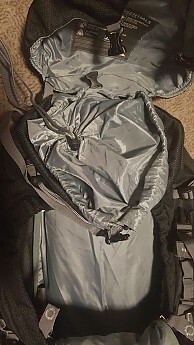 Great pack for medium to long hikes.Net pockets on each side for easy access to water bottles and room/pockets to organize gear. Zippers stiff but loosen up with Ivory soap on teeth. I purchased for taking a Scout troop on a multi-day hiking trail. They needed a medical professional in order to go on trail, so I needed a pack that would hold my food, tent, sleeping bag, cooking, food, water, and my medical equipment. This pack proved very good for this purpose. After 3+ days the pack kept everything in order and was very comfortable. Definitely would recommend to anyone wishing for a well made, comfortable, and easy to adjust pack for day or long hike. This pack did not even leave my house. Sent back to Dicks in the box it shipped in. 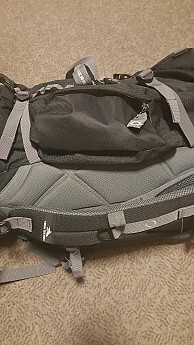 I ended up spending the extra $20 and got the Kelty Coyote 4750 which is a great bag for the price. I bought this pack to use on a 10 day trip around Costa Rica. I just came back from my trip and have to say this pack is overall a good buy for the price. I paid $96 for the pack online. The pack held up really well. Lots of pockets. Capable of storing a large hydration pack. All the zippers held up great. PROS: Pack looks nice. Like the color. Zippers and storage pockets held up really well. Plenty of room. Bottom storage for dirty laundry or shoes to keep separate from your clean clothes. Small Storage pocket on Shoulder for cell phone or iPod. CONS: The only problem I had with the pack was the main shoulder straps would not stay tight. You have to keep pulling on them to keep the pack secured to your back. Not a real big deal but something to think about. The waist is a little big. If you have a waist less than 32in then the pack will probably be a little big around the waist. I am 5' 10 170lb and the pack was perfect for me. Background before we begin: I currently own 2 Gregory packs, one large size Jansport pack, and 8-9, day or day and a half packs. One trend I am seeing as of this writing (March of 2010) is that ALL packs are becoming sleek, slim, and "streamlined". Too much so in my opinion! I tell my friends they have become "glorified and expensive duffle bags" with carrying straps. They seem to have lost all thought of pockets and organization. You would think that these newer packs are "wind tunnel tested" they are becoming so slim lined with NO external pockets. The same analogy could be compared like cars. After a while, they all look the same and "true functionality" is compromised. In comes High Sierra to the rescue! I have used two high dollar Gregory packs over the last 4 years and got sick of not having pockets on the outside to access my small gear items. If they did have pockets, they make them a big hassle to get anything out! The High Sierra line of backpacks caught my eye after purchasing one of their "Access" line of daypacks (see it reviewed by me as well). 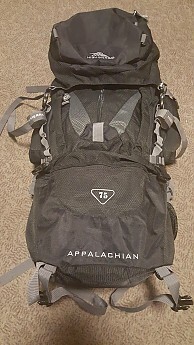 I purchased the Appalachian 75 because I needed a pack to fill that capacity range. With those thoughts in mind, let's take a look at it closely. First, with ALL backpack manufacturers in the world having communist governments manufacture all of their pack lines, it is now an advantage for us as a consumer in one regard. For reasons of seeking cheap labor, maximize profits, and release any manufacture facility headaches, this does one thing for you and I. ALL of the packs, regardless of price, regardless of manufacturer, all have the same production quality. More likely than not, they are made in the same plants! 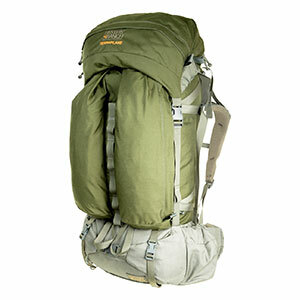 What separates a good pack from a bad pack now-days is simply the DESIGN of the pack and its FEATURES. With all of them made in the same place now, focus on design and features when picking out a pack. The manufacturer's "shot themselves in the foot" in this regard. 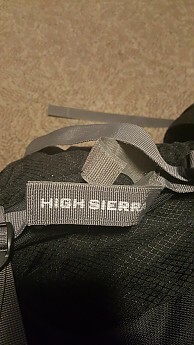 The High Sierra Appalachian's materials and workmanship are top notch and no better or worse than any top dollar pack I have owned from Gregory, Jansport, etc. When you are talking about a $300 pack from Gregory and a $100 pack from High Sierra, there is little to NO difference in quality. Made from material called Grid Weave Duralite, this pack is tough as nails. I hiked 9 miles with it in North Alabama and loaded it with 47 pounds for it's first trip. With some really NICE features such as integrated rain cover on the bottom of the pack and accessed from the bottom, wonderful and easy accessible side pockets, this pack really is tailored for what I was looking for in a pack. High Sierra is a company to watch closely. They are paying close attention to detail on all of their packs now in terms of design, and I have been impressed. Other features such as a fleece lined pocket in the very top of the pack for sunglasses, expensive electronic items are anything you don't want scratched up. The Ergo-Fit system was easy to adjust for my 19 inch torso. This torso adjustment system has been around for years. Jansport used to use it as well. It is a blessing and a curse. The blessing is that you can really "fine tune" the pack to your exact torso length, rather the high dollar packs that fit a torso "range" with their small, medium, and large size packs. The downfall of the Ergo Fit system on the High Sierra Appalachian 75 is that the pack has a little bit of "slop" at the top of the pack near the shoulders and does not fit real tight to your back. If you do a lot of climbing up mountains at steep angles, or walk up beside steep bluffs and along ridges, a sloppy pack can create a problem with holding your balance at times. The positive side of the adjustable system is that you can really get a very comfortable fit, and because it is not so tight against your back, the pack is a little cooler to wear. There are wonderful tie points all over the pack and the pockets are very easy to access. If you want your flashlight, it is 15 seconds away with the pockets protruding out and easy to access as opposed to the streamlined flush look most of the other pack designers are doing. The back and waist belt are made of their "Vapel Mesh" material. Some reviews read elsewhere stated this was a rough material and needed to be softer. I personally have no problem with it and it really made the pack vent well. The inside of the pack is separated in two compartments so you can store your sleeping bag in the bottom. You can also simply unzip that divider and the whole pack is one big compartment if you wish. Here is a slick feature you will not read about in advertising of the product. When the compartment divider is zipped up, they allow about a two inch hole on each corner near the body side to allow for sticking tent poles, Sven saw, or camp stools that might be long. That way, you have the whole length of the pack to carry a few tall items. There are actually two pockets in the top of the pack, one large one as standard in most all internal type packs, and as stated above, a second one fleece lined above the main one. This is sweet! I like this feature. Another really nice feature that was well thought out in my opinion. 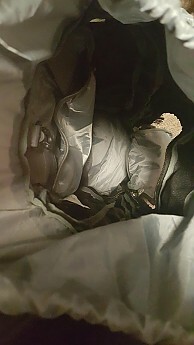 On my $300 Gregory packs, they made the inside material of the pack either jet black or a very dark material. You cannot see items good at all. You can have items in the pack that you were not even aware of! 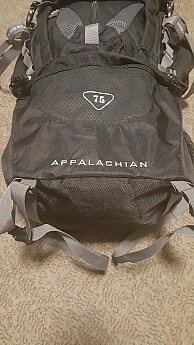 The Appalachian 75 pack is sweet in this regard. It has an orange colored liner, so items stand out inside the pack. If you open the pack looking for an item, it is very easy to spot. Again, obviously well thought out. 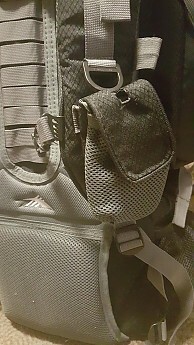 Well thought out, plenty of tie down points, quality as good as any high dollar pack, good fit, extremely tough material, protruding outside pockets if you like this type of pack as opposed to flush mounted sleek pockets on the majority of packs now days. Orange liner for easy visibility of items inside the pack, integrated full rain cover that stores in the bottom of the pack and will always be with you. Shoulder harness has attachment points for GPS, whistle, etc. H2O pouch handles most all types of hydration bags and tubes. Hip belt padding is good and wide, but suffers a major design flaw (see below). The Ergo-Fit system allows for fine adjustment to adjust about any size torso within the packs advertised range. The Ergo-Fit adjustment system allows for fine tuning but also allows more slop in the pack while strapped on the back than some people would want. The high dollar packs offer either a small, medium, or large size that fits a "range" of torsos. Positive side is that you will have a tight fit of the pack on the back. Downside, it cannot be fine tuned like the Ergo-Fit offered on the Appalachian. The weakest link in this entire pack is apparently inherit in more than one of its models that High Sierra makes. IT IS IN THE HIP BELT ADJUSTMENT. I have a 35 inch waist and it is just barely is enough to tighten the pack down tight. It does tighten up good. If I needed another 2 inches, I could not get it. This leaves what feels like 5 feet of extra webbing (it is really only about 10 inches). I have read of similar complaints on their largest pack. PAY ATTENTION TO YOUR WAIST SIZE IF YOU DECIDE TO BUY THIS PACK AND MAKE SURE IT WILL FIT YOUR WAIST. I feel like this is a serious design flaw and hopefully High Sierra will correct this soon. I was lucky enough that is was not an issue for me but this could be a "make or break" issue for you if you don't check this out. The two mesh pockets will hold a Nalgene bottle, but just barely. They are a little small. It would be nice if they were canted back for easy access while hiking. 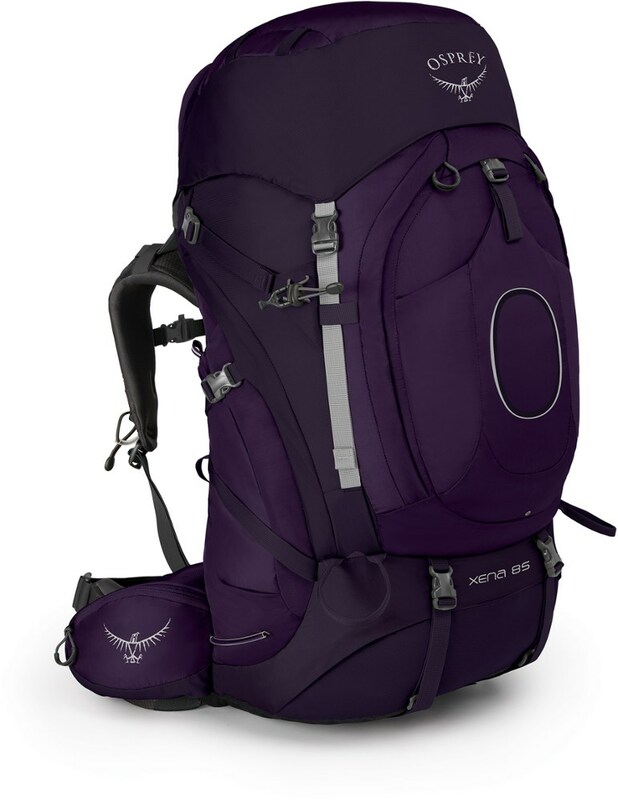 Bottom line: This is one heck of a pack with some very nice features. I think High Sierra will be giving the competition some headaches in the days ahead. With the playing field being level now by hiring China and Vietnam governments to do all the manufacturing process, it is all in the design of packs now. Nobody has anything over anybody in terms of material quality and build now. If you don't mind that you will have a pack that won't have a high dollar figure or a high dollar name associated with it or if you are simply on a budget, you will not be disappointed in this pack, in my opinion. Everything about this pack (minus the slight design flaw in the hip belt length) puts the pack right dead even with the $300-$400 packs. If you like the traditional "protruding pockets" in a pack verses the "sleek flush pockets" on the majority of other backpacks, then this is the pack for you. It is is about the only manufacturer doing this design anymore. I count my Gregory and Jansport packs "dead even" with this pack, now that I have used it. I recently used this pack on a 17-mile hiking trip on the Pinhoti trail in Talladega National Forest in Alabama. My review of this pack still stands. Overall, this is a great pack. It may not hug the back and fit "super snug" to your back like my Gregory Whitney or Reality, but for the price, this is an incredible pack for the money. My review also still stands. With most every single pack being made out of the same plants in China and North Vietnam, they ALL have about the same quality. It only boils down to design and fit. With the adjustments that come on it comes a mixed bag of blessing and curse. 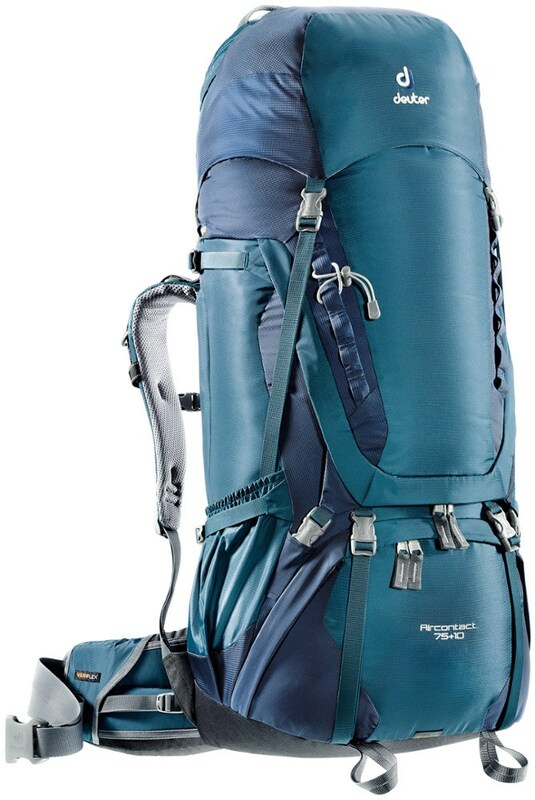 Because it is fully and totally adjustable, it has some amount of slack to it on the back compared to a high end pack that comes only in 3 sizes. On the other hand, by being adjustable, you can work on this pack until it feels downright comfortable. It's all in taking the time to fine tweak it. I think High Sierra is an up and coming company that will soon be rated with the big boys of Gregory, Lowe, and others. For now, they are regarded mainly as manufacturers of beginner backpacks. I disagree with this analogy. They are well designed packs! They have some very good designs and still conform to the old school way of making packs that way I love. That is square pockets and a square pack! With the current fad now, you would think that the packs have been "wind tunnel tested" they are streamlined so much. Design: Top Loading Internal w/front access, & zippered Bag Compartment. This pack meets those requirements to be sure, but I do have a few criticisms of the pack. I will list the positive points of each aspects first, and then the not so positive. 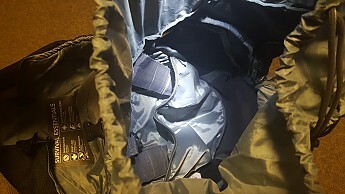 My general assessment: A fairly well made pack constructed from heavy water resistant fabric, standard weight webbing & clasps, and strong heavy zippers- which results in a durable but heavy pack. The top compartment has two smallish zippered sections, useful for map, small flashlight, hat, gloves, some snacks, small jacket, etc. It would be much better to have more space in the hood, as it is in order to add or remove clothing layers, one must fully access the main compartment, which is not easy if you have additional gear attached to the outside of the pack. The shoulder straps are well padded, and the tensioners (both upper and lower) are easily adjusted. The torso length is very easy to adjust, using a webbing ladder & wide webbing/velcro strap that goes around them. This makes it a snap to change, but allows for a little more play or 'slop' between the pack and harness than I prefer. The hip/lumbar belt is adequately padded, and very easy to remove/adjust. As others have mentioned the belt must be cinched almost all the way down on the average person. a very thin person might not be able to get it tight enough with a heavy load. 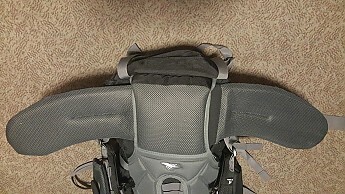 I have carried over 70lbs, and I am satisfied with the comfort and stability, I imagine there are other packs that improve in this category. The side bottle pockets are stretch-mesh, which is light and elastic, but potentially weaker than might be ideal. Each pocket is large enough to hold a nalgene or barely fit two narrow Kleen Kanteen bottles (or fuel bottles). 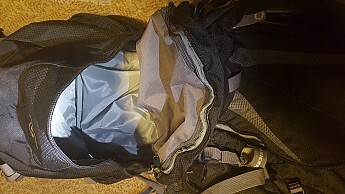 The main compartment divider is removable for bulky loads, and the lower "bag compartment" opens with very sturdy zipper, and is easily accessed. The main compartment also has a second front zipper access, and though I don't use it often it is great to be able to get something without unloading the whole pack. The front of the bag also has another small zippered compartment, only useful for very small items. The side compartments are quite useful, though rather small. they are large enough to fit small food bags, a narrow water or fuel bottle, emergency/first aid gear, etc, though not large enough for a fleece jacket. 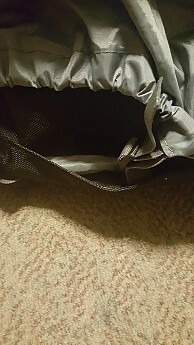 The rain cover compartment is located on the bottom of the bag, which is fine except that the velcro closure is too small, and can come open. I would have also liked to have more and better thought out webbing attachments on the outside of the bag- it just requires a little ingenuity to get everything secure if you have additional gear on the outside. I am pleased with the bag, and plan to use it for at least several years, though imagine I will try other bags someday when I can afford to experiment. A good pack for the money. Large zippers take lots of abuse, and don't break or snag. Hip belt feels pretty good, although maybe a little big for someone with my waist size (32 inches). Shoulder straps are adequate. Size is good for a five day excursion, and there are just enough pockets. This pack isn't the best, but is decent for the price.